Light travels in straight lines, which is how shadows are made. If you stand in front of the sun outside, you can see your shadow in the sidewalk. Can things in space make shadows like that? In fact, there's a special word for when things in space cast a shadow on the Earth. This is called an eclipse. Today we'll be talking about solar eclipses. The Earth orbits (or moves) around the sun, and the moon orbits around the Earth. A solar eclipse is what happens when the moon covers the sun, which then casts a shadow on the earth. This can happen once every 18 months and lasts for a few minutes. This video by SciShow Kids talks about how solar eclipses happen. **NOTE** This video discusses solar eclipses that will be occurring in 2015 and not in the future. Can I see a Solar Eclipse? It is very important that you don't look at a solar eclipse with unprotected eyes. The Sun's rays are very harmful to your eyes even if it is being blocked by the moon. To safely see a solar eclipse, you can get special glasses that will help you see the sun. Another way to view a solar eclipse is using a pinhole projector which you can make with an adult. This video by EyeSmart talks about how to safely see a solar eclipse. 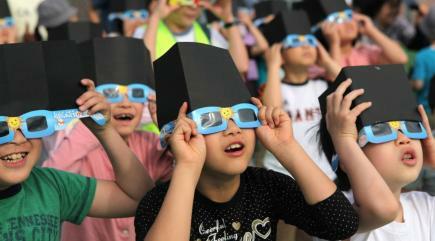 In this picture, a group of students are using solar eclipse viewers to see a solar eclipse. This is one website where you can buy solar eclipse glasses. Note- There are other websites that provide solar eclipse glasses. Feel free to recommend them in the forum. The following video explains how to make a pinhole projector. Be sure to have an adult around to help with the construction of the projector. This is one example of what your pinhole projector might look like when it is complete.